The fungal infection ringworm can cause a chinchilla to lose his fur around the eyes, nose, ears and feet. Areas infected with ringworm may appear crusty and red. Because ringworm is highly contagious, both to other animals and to humans, chinchilla owners treating ringworm should thoroughly clean everything in their chinchilla's cage, discard all used bedding and isolate an infected chinchilla from any other pets. Your veterinarian can prescribe oral antibiotics or topical antifungal creams to treat ringworm infections, which typically clear up in a few weeks. Some chinchillas will excessively chew their own fur, causing patches of fur to fall out. A variety of conditions may cause this behavior including stress, boredom, dietary imbalances, hormones or an overly warm environment. 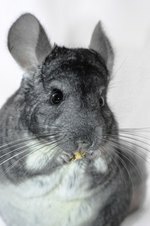 If your chinchilla is chewing his own fur, try introducing new chew toys, lowering the room temperature where your chinchilla lives or adjusting your chinchilla's diet. 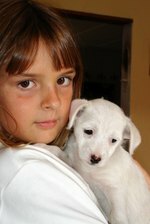 The Merck Manual for Pet Health also suggests applying a providone-iodine ointment to the affected patches of skin. Chinchillas possess a unique defense mechanism known as a "fur slip," where the fur on the back of their necks easily falls out when pulled, allowing them to escape from predators. Pet chinchillas who have a physical encounter with other animals or are roughly handled by people may experience a fur slip. Knowing how to properly hold and handle your chinchilla decreases the chances he will experience this unnecessary hair loss. Although harmless to chinchillas, fur slip hair loss can take several months to grow back. Chinchillas naturally shed their fur every three months, losing approximately eight strands of hair per follicle, significantly more than people who lose only three strands of hair per follicle. The shedding process, which last about two weeks, may create dramatic visible lines between new fur and old fur and may cause large quantities of fur to fall out at once, making the coat appear uneven and patchy. While the shedding is completely harmless, the excess hair can cause health problems if ingested so keep your chinchilla's cage clean during the shedding period.